If you are looking for information on the Deck the Walls franchise business opportunity, Deck the Walls franchises or Deck the Walls franchising, then you have come to the right place. 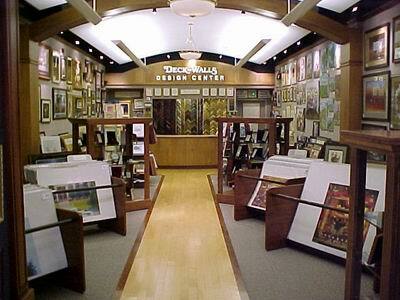 Deck The Walls, founded in 1979, is the mall based art and custom framing chain. We have been franchising since 1981 and have locations in 43 states. Our corporate Franchise Support Center is located in St. Louis, Missouri. Deck the Walls is North America's premier franchisor of art, custom framing and wall décor. Located primarily in shopping malls, we have been in business since 1979 and franchising since 1981. Each store offers a large selection of art and custom frame options, plus our unique framing systems. We have a friendly, inviting, creative atmosphere that you and your customers will both enjoy. Entrepreneur Magazine has consistently named Deck The Walls and our sister concept, The Great Frame Up, as two of the top franchises in the Art & Custom Framing category. Deck The Walls is a Franchise Concepts, Inc. (FCI) company. FCI is the world's largest, most successful franchisor of retail art and custom framing stores. Besides owning both Deck The Walls and The Great Frame Up, two of the largest national art and custom framing franchises in the United States, FCI also owns Framing & Art Centre, the only national art and custom framing franchise in Canada. Therefore, as part of FCI's rapidly growing family, which now has over 300 stores, you'll enjoy some unbeatable advantages. perfect franchise opportunity for you! We can locate an excellant location in a mall or non-mall lcoation near where you live, or if you'd prefer, you can use this as an opportunity to relocate to just about any other area of the country. If you qualify for our home office visit, you'll discover how our extraordinary opportunity has made us the world franchise leader in our business. You'll learn first-hand how our business works, meet the key people behind the company and see for yourself whether this opportunity is right for you.